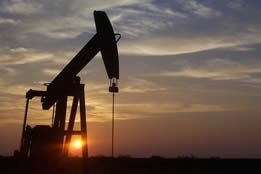 Yet more evidence that sentiment on the crude market can turn on a dime came Monday, as prices edged up slightly after weeks of steady losses and fears of global oversupply, and one respected agency warned that cuts to rectify any impending glut could lead to a supply tightening. In a struggle to find firm footing after prices fell over $20 per barrel since early October, Brent on Monday settled up a paltry 3 cents to $66.79 per barrel, while West Texas Intermediate rose 30 cents to settle at $56.76. The modest gains were said to have been triggered by news from Genscape that U.S. crude inventories fell in the latest week; but Stephen Innes, strategist for OANDA, pointed out that while prices have also risen "on hope OPEC [the Organization of the Petroleum Exporting Countries] and partners will act to reverse bearish sentiment....from a technical set up, bear mode remains intact." OPEC and its de facto leader Saudi Arabia is reportedly planning to persuade its members and allies - including Russia - to reduce output by 1 million to 1.4 million barrels per day (bpd), in order to counter the perceived crude build up. But analysts have several concerns about any impending management strategy, starting with the ability of OPEC itself to deliver the goods efficiently: Bob Yawger, director of energy futures at Mizuho, explained that "For a cut to be successful in supporting the market, they're going to have to present a front that is not fractured and the chance of that is looking less and less likely as December 6 approaches" - a reference to OPEC's meeting date in Vienna. Indeed, on Monday Alexander Novak, energy minister for Russia, said supply and demand needs to be closely monitored in coming weeks before deciding on whether to slash output - a clear indication the former Soviet Union isn't as sure as the Saudis and other OPEC members that the market is in oversupply. Even less confident in OPEC's proposed strategy was Fatih Birol, executive director of the International Energy Agency: at a news conference in Bratislava, he said the crude market is currently well supplied but spare capacity in Saudi Arabia is thin, and therefore cuts by key players could tighten markets. He added that players and consumers should all "have common sense". The ebb and flow of market trading itself is another factor to consider, and on that basis, Mark Fisher, founder and CEO of MBF Clearing, told CNBC that the market is close to bottoming out: "I think there's limited downside; if you ask me what the next $10 is, is it up or down? I think it's up." Fisher went on to say that the worst of the market rout was due to momentum trading and hedge funds dumping crude futures in order to buy natural gas, which has surged over the last month: "When that trade is finally unwound and when ... you start seeing ... some more negative stats with no negative price action that's ... when you'd want to buy the dip in crude." Last week, Harry Tchilinguirian, global head of commodity market strategy at BNP Paribas, speculated that if production falls further in Venezuela and Libya on top of the loss of Iran crude exports due to the U.S. sanctions, Brent could climb back to $80 per barrel this year.